Want a QUICK and EASY facial cleanse plus some cheeky TIPS? Marion Stone Beauty Want a QUICK and EASY facial cleanse plus some cheeky TIPS? Summer’s here and I’m getting sweaty! So, I’d like to ask you a question: Do you cleanse your face every night? I mean, really cleanse it, properly? OR…do you just splash your face with soap and water, and jump into bed after a tiring day? I understand you have a busy lifestyle; work, family, hectic days and exhausting evenings. I get it – I’m the same. But let me ask you this: How dirty does your car get a few days after washing it? How grubby are your nostrils after spending a day in the city? Now imagine all that dirt on your face, nicely mixed with perspiration, sun-cream, and make-up. Do you really want to take all that to bed with you? No thanks. Use a good quality, natural cleanser that is suitable for you skin type. I use mitts to take the cleanser off thoroughly and give myself a gentle exfoliation at the same time. Check out the action in the video! Lymphatic system, blood circulation, plump skin cells, muscle tone – your face is going to LOVE YOU! To make it even quicker, mix the serum, moisturiser and bee venom mask together and put it all on at once. Click here if you’d like to know more about the treatments I offer and how I can help you with your skin care. Would you like to learn more about how to feel and look your absolute best? Have you ever just wanted to press the F*CK IT button? Do you ever feel that LIFE IS TOO SHORT? Do you need EMOTIONAL HEALING..? Kate's beautician reveals buzz on bee-sting secret that made Duchess a blushing bride Shortly before her own wedding to Prince Charles, Camilla discreetly began using an organic alternative to Botox – a face mask containing bee-sting venom pioneered by beauty therapist Deborah Mitchell that claims to be a needle-free shortcut to youthful, line-free skin...."
Divine, relaxing facials that somehow manage to heal the mind, body, AND skin? Marion Stone is your lady. Massaging from shoulders to head, her treatments use firm pressure throughout to lift and tone the muscles. Acupressure and lymphatic drainage stimulate the blood and lymphatic systems, removing toxins and leaving the skin looking lustrous. Using organic products by Heaven Skincare, they are the perfect treat, whether you’re in Ibiza for a girls’ weekend or a couples’ getaway. 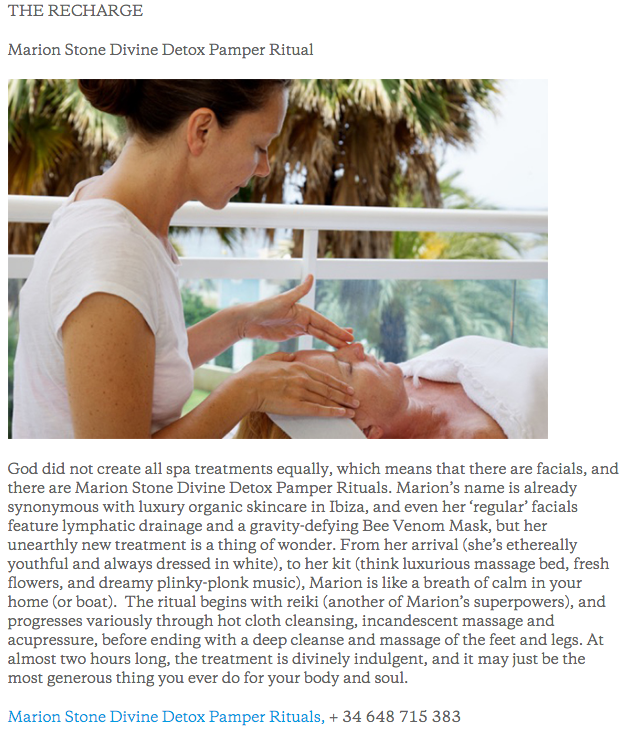 "Marion Stone’s luxury organic facial is excellent. It is a ‘holistic treatment for mind, body and skin’ that ends with a Bee Venom Mask (which stimulates collagen). My skin really does look younger and brighter afterwards. " 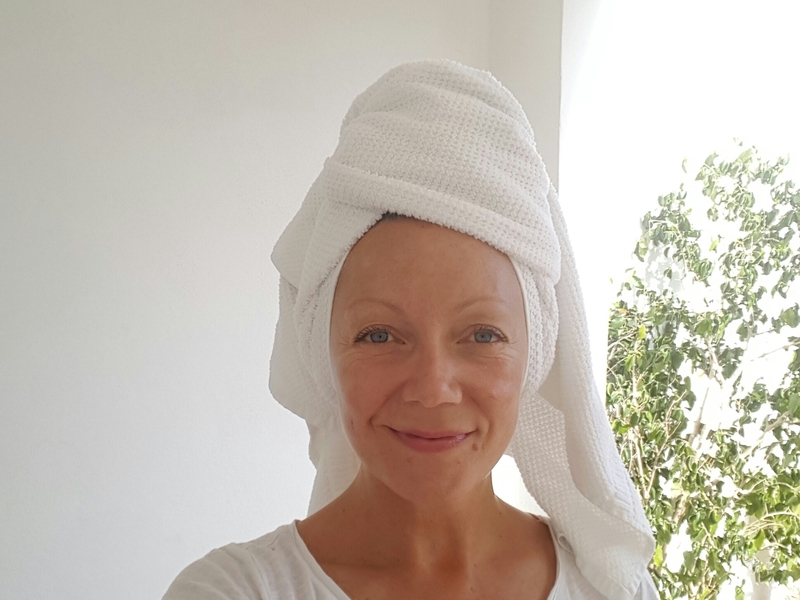 Visiting celebs and local sybarites have a new number on speed dial: esteemed facialist Marion Stone is now operating from Ibiza, and better still, she’s mobile. Marion’s facials are legendary for their striking ‘facelift’ effect: using the divinely organic Heaven brand, she triple-cleanses the skin before applying fruit acid polish, natural super- proteins and even a bee venom mask. However, it’s not just the products – Marion’s deep facial massage with lymphatic drainage is responsible for the unique instant lift. A transformational experience inside and out.